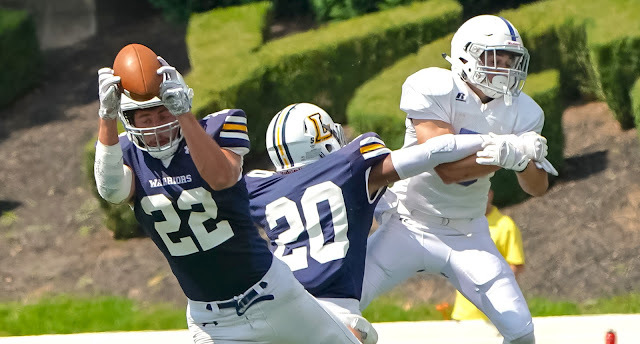 WILLIAMSPORT, Pa. – For the first time in the four-year history of the series, the Lycoming College football team will be a participant in the Centennial-MAC Bowl Series, heading to Franklin & Marshall College on Saturday afternoon, Nov. 17, for a 12 p.m. game. Franklin & Marshall (7-3) earned the third-seed in the Centennial Conference and will host the MAC’s third seeded Warriors (5-5), who earned the win via tiebreaker after five teams finished the conference regular season with a 4-4 record. Junior Jamie Fisher (Folsom, Pa./Ridley) is 17th in the country with 10 field goals made. Ticket prices for both Centennial-MAC Bowl Series games will be $5 for adults, $2 for students (elementary through college) and free for Special Olympics athletes and children under six. The two conferences will support the NCAA Division III Student-Athlete Advisory Committee (SAAC) partnership with Special Olympics by donating 25 percent of ticket revenue generated during the Bowl Series to the organization. Sr WR Nick Costello (Havertown, Pa./Haverford), who averaged 75.1 passing yards per game, leads the offense with eight touchdowns. The Warriors feature the third-lowest scoring defense (20.1) in the MAC and the team leads the league in interceptions (17). Both junior Jeff Coplin (Philadelphia, Pa./Central) and senior Joe Pinzka (Perkasie, Pa./Lansdale Catholic) are tied for second in the league in the category. Junior Jamie Fisher (Folsom, Pa./Ridley) is 17th in the country with 10 field goals made. The offense is paced by senior wide receiver Nick Costello (Havertown, Pa./Haverford), who averaged 75.1 passing yards per game and he leads the offense with eight touchdowns. The Diplomats are led by senior quarterback Tanner Erisman, who has 17 touchdowns against seven interceptions this season and sophomore running back Joe Hartley-Vittoria, who has rushed for 736 yards and seven touchdowns. Another tough-defensive minded team, the defense allows just 20.0 points per game and is led by senior Bobby McDevitt, who has 56 tackles, 10 for loss this year. The Centennial Conference and the Middle Atlantic Conference (MAC) announced on Nov. 5, 2015 their partnership to hold two postseason football games between member institutions known as the Centennial-MAC Bowl Series. In the spring of 2018, the two conferences voted and approved an additional bowl game to increase the series to three games beginning in the fall of 2018. The Centennial-MAC Bowl Series will now be the top-three teams from each conference that are not selected to the NCAA Division III Championship. The format of the Centennial-MAC Bowl Series has changed with the additional game. The top seeds, second seeds, and third seeds will face each other unless the teams have already played that season. In that case, commissioners from each conference will determine new pairings. The Centennial Conference will host the top-seed and third-seed games and the MAC will host the second-seed game in even years, and vice versa in odd years. I. There are no playoffs for conference ties. All sports implement the following tiebreaking system in descending priority order to qualify team(s) for the MAC championships. A. Ties are to be broken from the top of the standings to the bottom, with the exception of head-to-head results in regular season conference contests (these are to occur prior to applying procedure #2). The progression through a procedure stops at any point where teams cannot be ranked. B. If more than two teams are tied, and one of the teams has not played a team in a specific tiebreaker, that particular tiebreaker does not count. C. When more than two teams are tied, that ranking, based on wins and losses against each other, qualifies the needed teams. If that win/loss ranking can’t be determined, and in the case of two tied teams, procedures #1 thru #4 are used to qualify a team or teams. Head-to-head results between and among the tied teams in conference games. Tied teams’ won-loss records versus conference teams starting with #1, then #2, etc. Conference winning percentage of teams you beat in eight MAC games. Point differential between and among the tied teams, with a maximum differential of 17 points.